Offer a moment of relaxation with this wine basket, showcasing the Queen Adelaide Shiraz Carbenet (Aust) 750ml and Alexender Anour De Nos Merlot 2013. 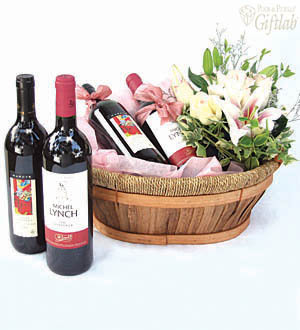 This basket comes with Stargazers and Roses. Truly a gift that leaves a distinctive signature of style and highly refined taste. Wines mentioned are available within Klang Valley, Penang and Johor. Type of wines available differ in other States. For outstation orders, you may check with our Customer Care at 03-78830233 on the types of wine.